Cosyfeet have launched a range of wide fitting boots that are 100% waterproof. Specially designed to fit very wide or swollen feet, they’re also breathable and windproof to ensure your feet stay warm and dry, whatever the weather. Cosyfeet have launched a range of wide fitting boots that are 100% waterproof. Specially designed to fit very wide or swollen feet, they’re also breathable and windproof to ensure your feet stay warm and dry, whatever the weather. 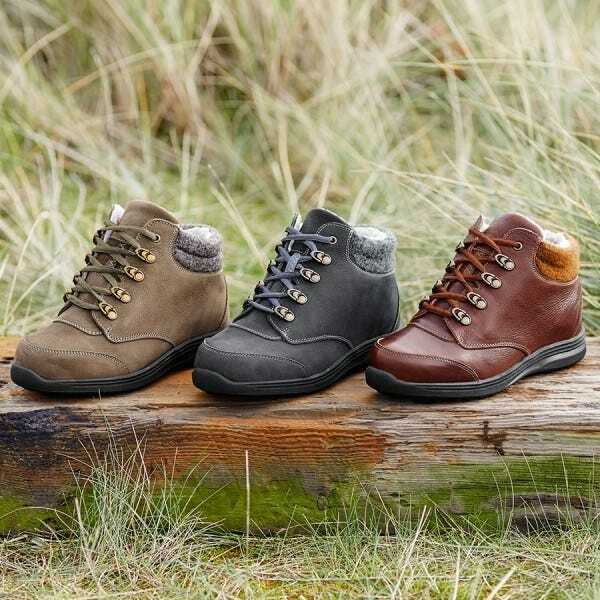 Perfect for walking the dog or strolling on rainy days, Moose for women and Livingstone for men offer good grip and are shock-absorbing for extra comfort. From out to in, it’s very durable and waterproof, allowing you to stay dry and enjoy your activity in comfort. From in to out it allows sweat to pass through and helps reduce overheating and perspiration build up. The membrane and seams are sealed using a waterproof tape which is applied by specialist equipment and machinists.